How much money will you need in Luxembourg? €148 ($166) is the average daily price for traveling in Luxembourg. The average price of food for one day is €69 ($78). The average price of a hotel for a couple is €135 ($152). Additional pricing is in the table below. These average travel prices have been collected from other travelers to help you plan your own travel budget. Luxembourg is a completely landlocked country located in the Benelux. It is bordered by Belgium, France and Germany. It's location make it a mixing bowl of the Germanic and Latin cultures. 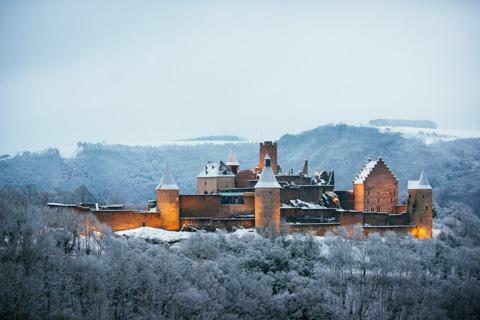 Luxembourg is the only remaining grand duchy in the world. A grand duchy, also referred to as a grand dukedom, is a territory that is headed by a monarch who is either a grand duke or grand duchess. Luxembourg is also the second smallest state in the European Union. The climate in Luxembourg is similar to that found in nearby countries. Winters may be mild, but January and February are the coldest months and temperatures can fall to -15 degrees Celsius. Summer can be quite hot, with July and August being the hottest months. It is not uncommon for temperatures to reach about 30 degrees Celsius. Summer is the peak season for travel but the most comfortable times to visit is during the spring and fall months. Luxembourg's National Day is on June 23rd. Luxembourgs terrain is mostly made up of gently rolling hills and valleys. The northern area becomes slightly mountainous and there is a steep slope down to Moselle flood plain in the south. Luxembourgs currency is the Euro. Every country on the euro issues its own coins, which are valid throughout the eurozone. Luxembourgish coins are among the rarest of the euro coins, even in Luxembourg itself, so if you stumble upon one, it's worth holding on to as a collectable or simply a souvenir of your trip. Gromperekichelchen: Translated to mean "Potato Biscuits", this dish is a fried shredded potato cake. It is made with onions, shallots and parsley and is commonly served at outdoor events such as fairs, festivals or markets. It makes for an excellent snack on a cold winter day.